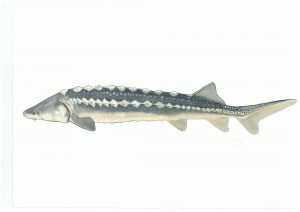 Russian Sturgeon (Acipenser gueldenstaedtii) was formerly the most widely distributed sturgeon species in the Danube river. It regularly migrated upstream as far as Bratislava. Some individuals have even been spotted in Vienna (river km 1,925) and Regensburg (river km 2,381). 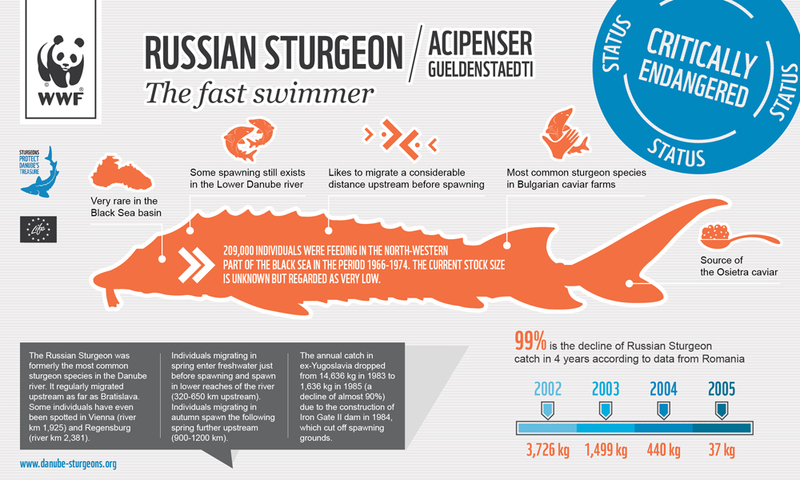 Today Russian Sturgeons are listed as Critically Endangered. More than 200,000 individuals were feeding in the north-western part of the Black Sea in the period 1966-1974. The current stock size is unknown but regarded as very low. 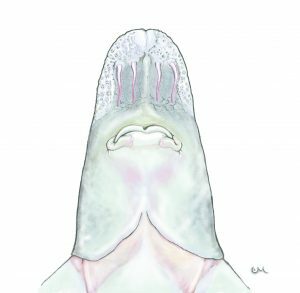 Individuals migrating in spring enter freshwater just before spawning and spawn in lower reaches of the river (320-650 km upstream). Individuals migrating in autumn spawn the following spring further upstream (900-1200 km). The annual catch in ex-Yugoslavia dropped from 14,636 kg in 1983 to 1,636 kg in 1985 (a decline of almost 90%) due to the construction of Iron Gate II dam in 1984, which cut off spawning grounds. Very rare in the Black Sea basin. in the Lower Danube river. Source of the Osietra caviar.